Save it. Maintain a personal "hard drive" on the Internet -- where your important files are always safe and accessible. The amazing X-TOOL lets you create a personal extension of your existing hard drive... on the Internet, and accessible only by your personal username and password. Archive and share business documents. Store MP3, JPG, GIF, BMP, DOC, WAV files and more. Upload valuable family photographs. Whatever you want to save, you can do it. It's fast and easy. 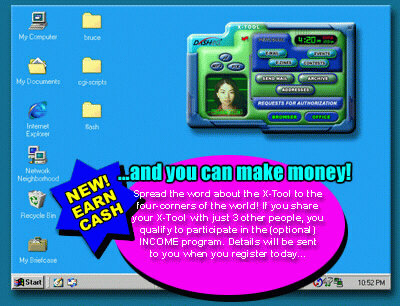 Click Here to get the details you need to receive your amazing X-TOOL.